The Pikeville Medical Center Family Practice Clinic features complete family practice services and osteopathic manipulation therapy.The clinic is open Monday through Friday from 8:00am until 4:30pm and is located at 184 South Mayo Trail in Pikeville. There are several residents and attending physicians serving patients in the region. 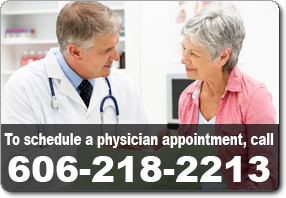 The patient base includes infants through geriatrics and all services are performed on an outpatient basis. Attending physicians are board certified through the American College of Osteopathic Family Physicians and several are also certified in Neuromuscular Skeletal Medicine – OMM.